So you baked the homemade bread. Your kitchen is smelling great. Now what to do with your rustic bread loaf. Well how about some tortas. Tortas are the Mexican variant of the Hero Sandwich. You can make them in all sorts of flavors and fillings. Traditionally, a torta is not a torta without out some chicharon. Chicharon is fried pork rinds, which taste better than how it sounds. The best quality chicharon can be found in Mexican butcher shops. The stuff they sell next to the potato chips is made from flour, and not real chicharon, so it should be considered a poor substitute. For the fillings you can use cooked chicken, ham, bacon, or basically any kind of cold meat. You can also top with lettuce, tomatoes, onions, and especially avocados. Go crazy with the cheese. This is my recipe for Ham and Cheese Tortas. For Ham and Cheese Tortas. Using a serrated knife, slice the loaf of bread lengthwise to the size of torta that you want. Put the Bread sideways and slice to make two pieces. Spread the mayonnaise to the top part of the bread. Break the chicharon pieces and add to the bottom part of the bread. Layer the Ham over the chicharon. Top with the lettuce and cheese. 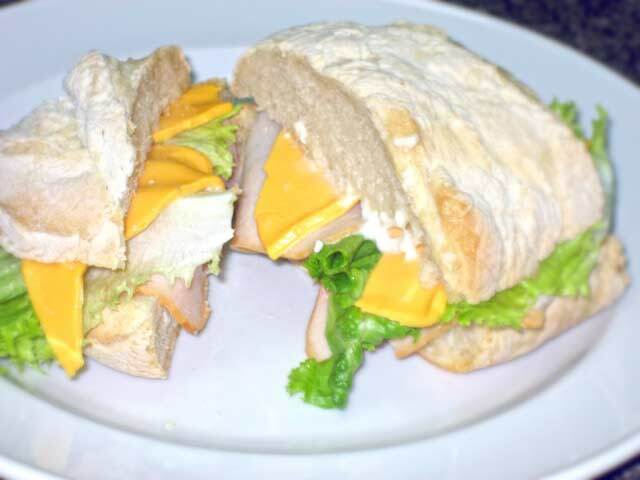 Bring the top part of the bread to complete the sandwich.